Crystal Visions manufactures all of its own blends from Colored Rock Salt to Advanced Treated, we have anything you need to get the job done right! Reduces application rates up to 50%! Premium sized sidewalk salt crystals treated with Magnesium Chloride, Organic Carbohydrate and a Corrosion Inhibitor coating. Safer for pets, sidewalks, plant and equipment! Sizzle Lite is a medium grade dry blend consisting of a 5% mixture of calcium flake with premium sized salt crystals. 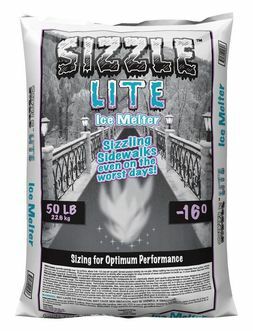 Sizzle Lite's blend will melt ice faster and longer than plain rock salt. This allows for reduced application rates and quickly providing clean and safe surfaces. Premium sized salt to efficently melt ice away down to -16 degrees.